The International Hot Spring Hotel was created in 1995 by its German owner Peter Philipp Wirth, who with his mother Heide established the only hotel in Bahariya with a hot spring at its centre. Peter hails from the small German town of Heppenheim an der Bergstrasse in the province of South Hesse. Peter has lived in Bawiti since the hotel opened, while Heide comes to help out during the winter season. 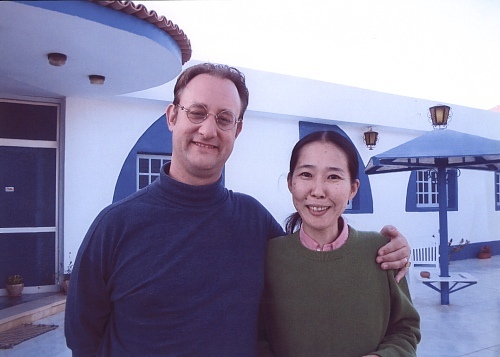 Peter's Japanese wife, Miharu Shimazaki, comes from the famous Hot Spring town of Hakone in Kanagawa Prefecture, close to Fuji Mountain. Together with local people, Peter and Miharu have built up the Hot Spring team. All its fifty-five employees are from Bahariya Oasis; forty are staff members at the International Hot Spring Hotel and 15 are guides with specialised training in conducting desert safaris in the Western Desert of Egypt. The people of the oases call themselves Wahati. They are the Bedouins of the Western Desert, and their ancestors have lived in the oasis since Neolithic times. They could thus be called the true natives of Egypt. Peter is a founding member of the NGO DESERT LOVERS, whose goal it is to keep the oases and the desert pristine. This objective can only be achieved by training the Bedouin drivers to instruct guests to respect the desert environment and cooperate with the rangers in protecting the White Desert National Park and the Protected Area of the Black Desert, which is soon to be set up. © Copyright International Hot Spring 2009 - All rights reserved.